IGS-PandaNet launched a new subscription service called "The IGS-PandaNet Mail Magazine", in June 2001. The IGS-PandaNet Mail Magazine is a new service in which commentaries given by professionals on games that you, our members, play on the IGS PandaNet Internet Go Server (IGS), are sent by e-mail to all subscribers. Each month several games will be selected completely at random from the games played on IGS-PandaNet. 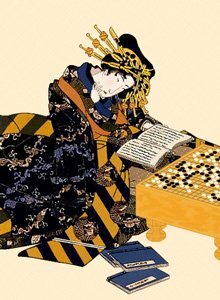 Top Japanese professionals will analyze them in detail. These commentaries will then be sent to you by e-mail three times a month (two games with each mailing). If you'd like to see a sample by Michael Redmond 9-dan, please download the (new version) PANDA-EGG EGG405b-English.exe. This client for IGS is free. If you have not already installed PANDA-EGG Version 4.05b with the Game Commentary function, please click on the URL below and download the setup program to your computer. When the download is finished, double click the EGG405b-English.exe and execute the program to install the PANDA-EGG. When the setup of PANDA-EGG is finished, please open your browser and click on the URL below. Your browser will automatically start the PANDA-EGG client and the game commentary will begin. 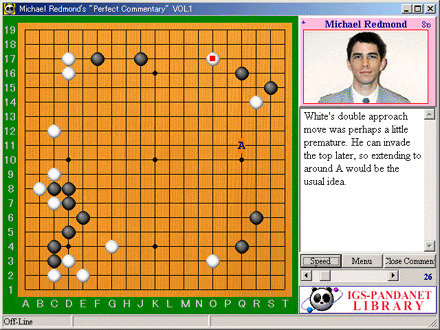 Once you have viewed a commentary, it is stored in PANDA-EGG's "Replay stored game records", so you can view them again even after disconnecting from the internet. NOTE: Click on "Close Commentary" to continue to the next commentary. Select the "Menu" to control the playback speed. If you wish to subscribe to this service every month, the "IGS-PandaNet Mail Magazine" is mailed three times a month, giving a total of six game commentaries. The subscription fee is only 500 yen a month. IGS-PandaNet Office, Panda Net Inc.
Copyright© 2002 Panda Net Inc. All rights reserved.